In undertaking this project, my growing commitment to seamless design faced a key test. The owners purchased this dilapidated Mediterrainian/Spanish Colonial house built in the 1920’s on South Hinchman Avenue in Haddonfield. The house had been poorly maintained over the years, and by 2006, had a roof that leaked so badly it could be felt in the basement from the roof. 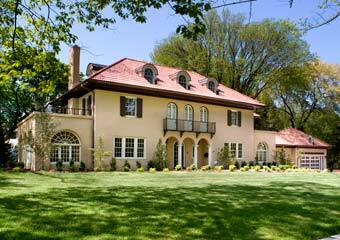 We were hired to enlarge and substantially remodel the house while maintaining its original Mediterranean flair. The house sat far back on the lot which created a large front yard on both Chews Landing and Hinchman Roads, and a small rear area for outside entertaining. A detached garage was situated in the far corner approximately 60’ to the side entrance. The houses’ masonry frame as still intact and the Kohn’s wanted to have a more traditional tile roof on the house. Since the weight of true tile would compromise the roof framing, a composite tile roof material was purchased for the roof. All of the windows were replaced, mechanical and electrical systems throughout needed complete replacement. 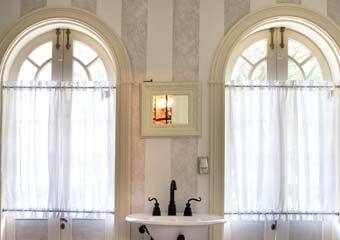 We design a matching breakfast room to the existing sunroom with circle top windows letting light poor into that part of the house. The kitchen was relocated to the front part of the house with access to a newly design family room open to a courtyard with slate flooring. The trick was to tie the garage to the main house with a new mudroom entrance, laundry, powder room overlooking the courtyard itself. The design is key to the layout and creates a seamless bond between the two buildings. 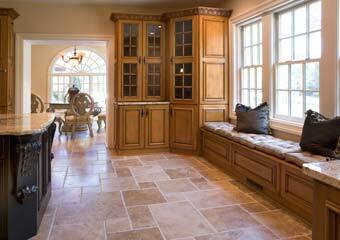 Above the garage, a playroom or office is included with powder room. Upstairs, a new master suite houses large walk- in closets, bath with Jacuzzi tub, double shower and a newly created balcony off the bedroom area. 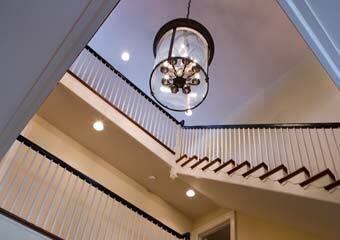 Two additional bedrooms with refinished hardwood floors open to the foyer below. Three additional bedrooms grace the top floor. Outside, the rusticated style stucco was matched and painted to work with the roof colors and trim on the house. The hoop drive was maintained allowing access to the front entrance and mudroom doors.